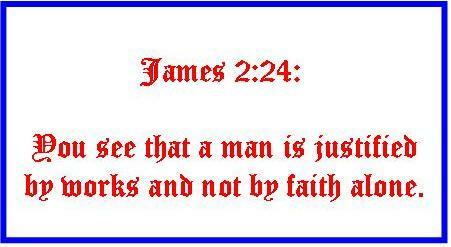 Catholic Bible 101 - The Five "Solas"
James 2:24:You see that a man is justified by works and not by faith alone. Strange that the one sola that does appear in the bible contradicts the very sola itself. Works (good works, not useless Jewish works of the law) are part of being justified. The Catholic Church teaches that justification begins at Baptism, when the Holy Spirit comes to us, even while we are infants. And "being saved" is a lifelong journey that doesn't end until we die and are allowed into heaven. A lot of Protestants talk about "when they were saved", as if it's in the past tense. Catholics would agree that whenever you began taking your faith in Christ seriously was certainly a great time, but it was only a first step, not the entire journey. What really counts is your faith at the time of death, not your faith when you first started believing 20 years ago. "The saying is sure. I desire you to insist on these things, so that those who have believed in God may be careful to apply themselves to good deeds; these are excellent and profitable to men." Applying the word "alone" to scripture also means that anyone can properly interpret it, without the Magesterium and Sacred Tradition. In other words, the Catholic Church only claims infallibility with the official documents of the Church, spoken "ex cathedra" ("from the chair") by the Pope. This sola claims that anyone and everyone who interprets scripture on their own is infallible! And how wrong is this today, with over 30,000 Protestant denominations, with some even claiming that homosexuality is no longer sinful! The next one, "Grace Alone", isn't found in the Bible either. Catholics would agree that we are indeed saved by grace, which is a free gift from God. Where we differ is the method of how we receive that grace. The Catholic Church regularly dispenses sanctifying grace through the sacraments. The protestants believe that God just gives them grace whenever He wills it, sacraments or not. The Catholic version of this one would be that we are saved by grace, which increases our faith, and leads us to do good works as a very necessary fruit of our faith. The fourth one, "Christ Alone", also sounds great. Who could argue with the fact that we are saved by Christ alone? The problem with this is that the 3rd person of the Blessed Trinity, the Holy Spirit, also plays a HUGE role in our salvation. According to the bible, we are temples to the Holy Spirit. Peter and the other apostles all followed Jesus and ate with him, talked with him, and tried to follow him. It wasn't until Pentecost when the Holy Spirit came upon them that they received power (Acts 1:8). Catholics receive the Holy Spirit at Confirmation, and can receive Him again and again through the laying on of hands by charismatics (to reinvigorate your faith). 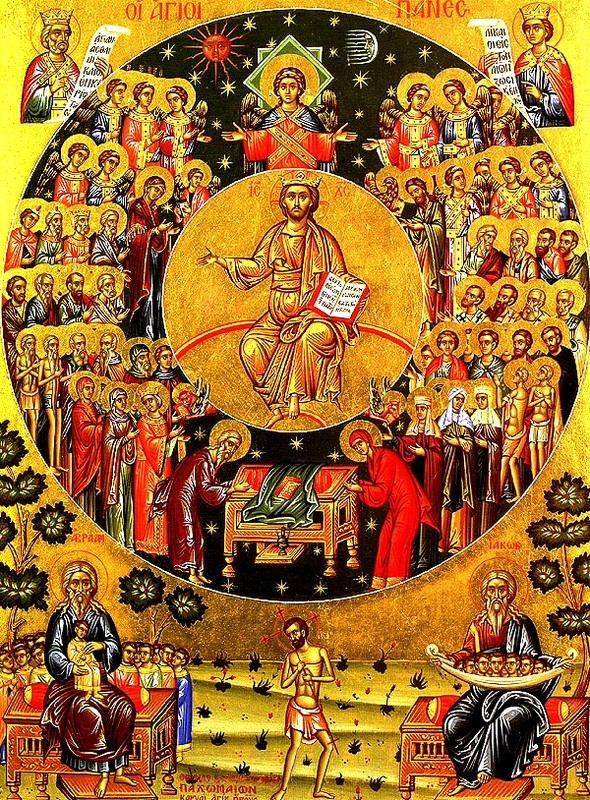 And what about the role that the Communion of Saints plays in our salvation? They lead us to Christ, as do our parents, our friends, and our fellow Catholics. The whole problem with this particular sola is that it isolates us into a "Me and Jesus" scenario, where I don't really need a Church or a family telling me what to do. And that is so wrong. Jesus set up His Church for a reason, to be His Kingdom on earth. And this sola allows for no glory to God our Father, who we pray to each and every time we say the "Our Father" prayer. The last one is Soli Deo Gloria, or "Glory to God Alone". This one also sounds like a winner. However, there is one problem with it. Jesus Himself said in John 17:22 that He gave His glory to his apostles (at the Last Supper, when He gave them the Eucharist). And while none of the apostles' lives or works will save us in and of themselves, they are indeed one with Christ (1 Corinthians 6:17) and they are partakers in the divine nature (2 Peter 1:4). It really is okay to venerate the saints, which is not the same glory and honor we need to give to Christ. A lot of protestants confuse veneration of the saints with glory to God. Mention the Communion of Saints to a Protestant who says the Apostles' Creed every Sunday, and you will usually get a blank stare back. In other words, most Protestants who recite the Apostles' Creed say they believe in the Communion of Saints, but they do not know what it means. What it means is that the saints in heaven are our brothers and sisters in Christ who have gone before us, and who help us in our journey in this life. After all, Jesus says that they are ALIVE (Luke 20:38). And since they are partakers in the divine nature, according to 2 Peter 1:4, that means that they can hear us and help us. Catholics could come up with a lot of these solas. Since the bible says that we must eat and drink the body and blood of Jesus to have life within us (John 6), then we could say that we are saved by "The Eucharist alone". And since Paul talks about the value of personal suffering for the Church in Colossians 1:24, we could say that we are saved by "Suffering alone". And since the Bible says that the Church is the pillar and bulwark of Truth (1 Timothy 3:15), then we could formulate the doctrine of being saved by "The Church alone".And since we have to be forgiven for our sins before we can enter heaven, we could come up with the doctrine of "Confession alone". And how many more of these could we invent if we had the time? Lots. But to no purpose whatsoever. The Bible was meant to be taken as a whole, and to not be broken down into parts for convenience' sake.